This pink and green diaper cake is so pretty! I think the flowers at the bottom are lovely and using the green diapers is such a good idea! It gives the diaper cake a layered look and really compliments the cake. It's perfect! Barbara, one of our readers, made this cake for a baby shower and then shared it with us! And are we ever glad she did!! 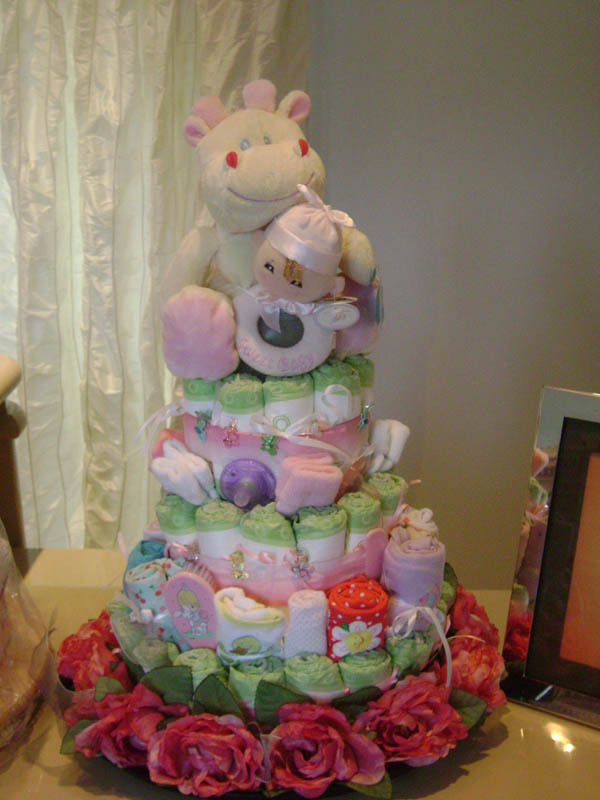 Our diaper cake gallery is all thanks to wonderful contributors like Barbara who share their time and creativity to give inspiration to all who come here looking for diaper cake ideas. Thanks Barbara, for your wonderful diaper cake! I followed the basic directions on your website (great instructions)using approx. 36 disposable diapers and an 8 oz. diaper for the base of the first and second tiers and a bottle of baby wash for the third tier. I filled in between the "layers" with rolled up onesies, socks, baby items such as pacificers and brush/comb set. Topped it off with a cute little stuffed toy and rattle. Used silk flowers around the edge of the serving plate for a realistic "Cake" look. Thank you for the wonderful ideas. Really great website. Thanks again Barbara!! Beautifully done!